A long tree lined gravel driveway leads back to the 1 ½ story, 3 Bedroom Home with an attached 3 car concrete floor block garage; Barn with 7 stalls and a feed/tack room with loft; Chicken Coop; Storage Shed with concrete floor; Detached 2 car garage with overhead doors and workshop with concrete floor; Shed with 4 Stalls and Pasture Paddocks all situated on 14.96 +/- mostly level Acres. This home offers a large open Living Room with exposed wood beam ceilings, and wood burning stove inserted into the beautiful floor to ceiling stone face & hearth fireplace; Front Room; Bedroom with closet; Full Bath with shower over tub; Eat-In Kitchen with top & bottom cabinetry, washer/dryer hookups and leads to the concrete floor enclosed porch. Upstairs: 2 Bedrooms with large closets. 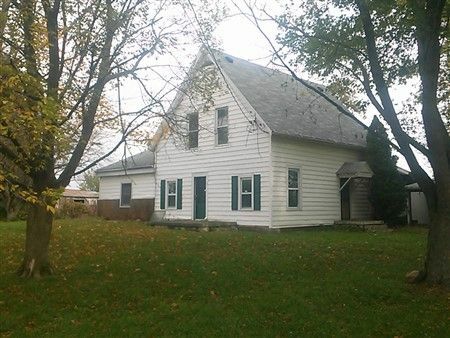 Home equipped with 200 AMP Breaker Box, Public Water/ Sewer, & Natural Gas Meter (All Utilities Available). 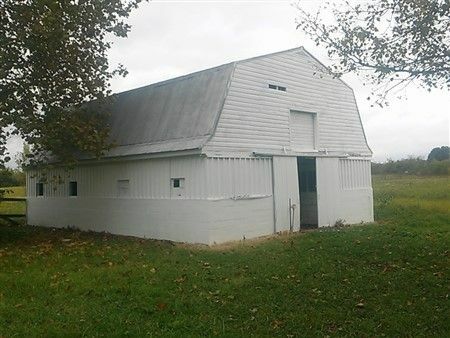 The home needs some updates and TLC including a replacement heating system, but has much to offer on this nice unique Farm! Real Estate Terms: Minimum Bid $40,000. ; $7,500. Down at time of sale in cash/check with positive photo ID; Offered free & clear prior to closing on/before January 6, 2015; Possession upon delivery of deed; Sold As-Is; No Buyer’s Contingencies Exist. Taxes & Legal: Net Annual Taxes: $1,675.44, Assessments: $40.02 recurring Bloomingburg. Fayette Co. Parcel No. 16002500304800; Vol. 196, Pg. 3164; Paint Twp. ; Miami Trace Schools; Fayco Development LLC.